"Perhaps, if a bold swimmer, you may venture out a long way - once! Not twice! - even in company. As the water deepens beneath you, and you feel those ascending wave currents of coldness arising which bespeak profundity, you will also begin to feel innumerable touches, as of groping fingers - touches of the bodies of fish, innumerable fish, fleeing toward shore. The farther you advance, the more thickly you will feel them come; and above you and around you, to right and left, others will leap and fall so swiftly as to daze the sight, like intercrossing fountainjets of fluid silver. The gulls fly lower about you, circling with sinister squeaking cries; - perhaps for an instant your feet touch in the deep something heavy, swift, lithe, that rushes past with a swirling shock. Then the fear of the Abyss, the vast and voiceless Nightmare of the Sea, will come upon you; the silent panic of all those opaline millions that flee glimmering by will enter into you also." Being brought up in Greece and spending four years of her teenage life on the island of Syros, it was many times that Eileen Botsford experienced an overpowering connection with the natural elements of the sea. Swimming from early spring in to late autumn she learned to read the weather and the sea, to find peace in deep waters, and to feel a unity with the wilderness of nature. Upon reading the excerpt above, Eileen realized she felt like Lafcadio. Now that she has lost that connection with the sea Botsford wished to relearn it. 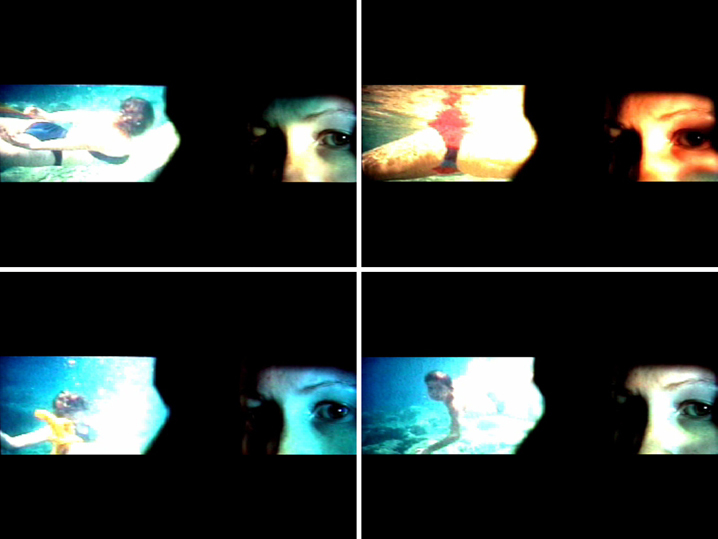 The images pictured in Swimmer are from when she still had that connection and tried to document it visually by taking slides of her moments underwater. © THE AMERICAN COLLEGE OF GREECE: ACG ART.